After introducing iWork for iCloud during its Worldwide Developers Conference and sending invites to registered developers soon after, Apple has begun inviting normal users to test the software according to a number of MacRumors tipsters. iWork for iCloud offers in-browser versions of Apple's iWork software suite, including Pages, Keynote, and Numbers. The software can be accessed from both PC and Mac computers as well as a number of mobile devices. It is expected to be released to the public later this year. Thanks to Jason and the other tipsters! Gone are the days of having to pay the Apple tax just to make a pretty pigment presentation! Wow a screenshot of Windows from Apple and it's an up to date version? I remember they used to use screens of XP well into Windows 7's release. I remember when I used XP well into Window 7's release. Seems like nearly anybody can get in. I wasn't sent an invite but can easily access it via beta.icloud.com. I didn't get an email, but It shows up in iCloud for me. Pretty cool IMO! I still use XP well into Windows 8's release. Got me excited for a second. I thought the Blackbook was back! I thought it was back in black. I've been on the beta test for some number of weeks now. It works well enough but I never find a real use for it. 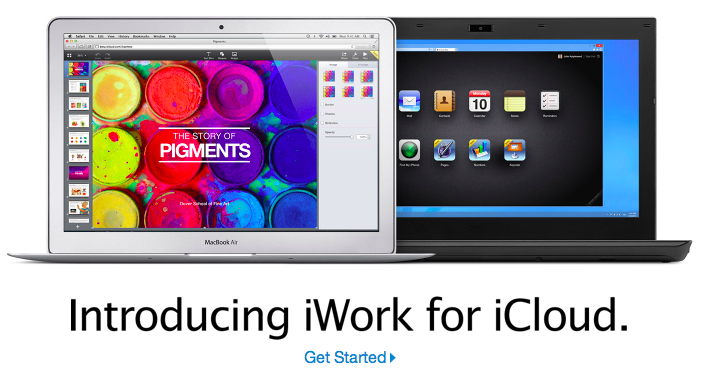 What's the point if you have a Mac you can run iWork native on the Mac. This is great if you are on a PC, or were seriously broke and could not afford Pages and Numbers. But if you own a Mac I don't see the point. One serious flaw is that all the Mac features are not supported so if you open a Mac iWork document in the on-line version you get asked if you want to make a copy with the format features removed. You click "yes" and go. But now how to save your edits back to the "real" document? For this to work all version must be 100% identical. It shows up in icloud.com for me on the "home screen", but when I click it it displays "Coming soon: Pages/Numbers/Keynote for iCloud Beta. Create and edit beautiful presentations/spreadsheets/documents right in your browser on Mac or PC. There is a blue button marked "Get Pages" underneath the message. If I click that, it opens the Mac App Store page for the respective app. im a registered developer, how do i get the beta? No way I'm using Office 365 or Works in the Cloud. i prefer having the documents on my hard drive. Being able to write documents in the internet browser is neat, but if not for... NSA. When your account has access, the iWork icon will be replaced with 3 icons for the the individual iWork apps. Wow, it amazes me how people complain about free stuff.